"We saved approximately $50,000 in development costs and two and a half man-months of development time using Iron Speed Designer." 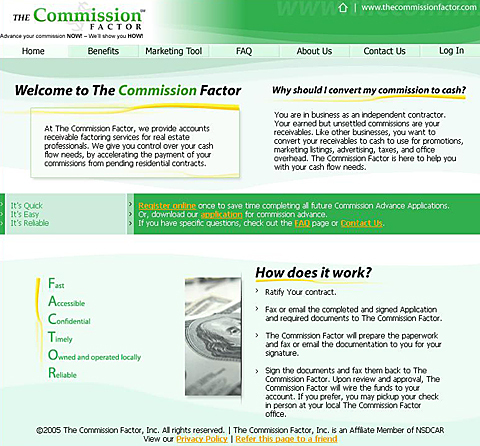 The CommFact Application is a brand new application, and was created exclusively for TheCommissionFactor.com. TheCommissionFactor is a small start-up company that advances real estate commissions for agents. They needed a working solution as quickly and cheaply as possible and wanted to be sure that the application would not require a lot of back-office staff to manage. 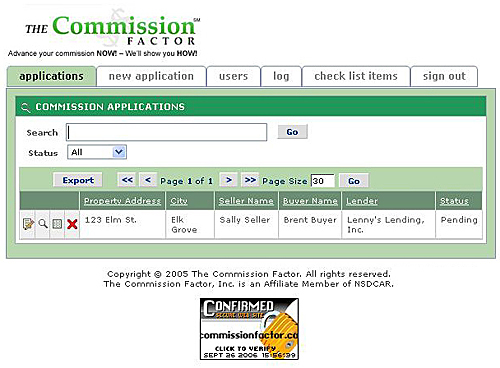 The CommFact application is used by the real estate agents and brokers employed by TheCommissionFactor.com as well as their clients. The program allows them to request an advance on their real estate commission. TheCommissionFactor staff review the applications and either approve the request and send the money out, or decline the request. At the close of escrow, the escrow closing office uses the agent's or broker's commission money to repay the advance to TheCommissionFactor. An agent or broker begins by registering on the application's main web page. The application collects his personal information including license number, agency information, and personal residence owner information. Once the information is submitted, a user account is created but remains "inactive" so the agent or broker cannot access the system yet. He automatically receives an email notification to this effect. TheCommissionFactor staff also receives an automated email that a new user has registered. They log on, see the "pending" user and either activate or lock the user's account depending on whether or not the submission is valid. An email notification is sent to the user with his username and password and how to access the site and submit applications if he was approved. The client requested this type of verification process to prevent competitors from viewing a majority of the site, making it hard for them to duplicate the application. The Edit Application Submission screen allows administrators to modify submission details, as well as manage checklist To-Dos. Next, the user completes an application submission in order to request an advance of funds. After filling out the online form, much like a loan application, TheCommissionFactor staff is notified via automatic text message that a new application needs processing. PDF documents are automatically created when a new application is submitted and automatically emailed to the requestor to "wet-sign" and fax or mail back to TheCommissionFactor. Also, when the submission is saved to the database, a configurable Checklist of To-Do items are applied to the new application, each of them marked as "Undone" and in a specific to-be-done order. TheCommissionFactor staff can then simply follow the To-Do list, performing each back-office task, such as ensuring a signed document is received by the broker via fax or mail, ensuring the agent actually owns the commission on the property that will soon close, etc. As each item is completed, they check off the item. This process could take a full day to several days, depending on how speedy the requestor is at providing the needed documentation. Finally, while the requestor is waiting for his application to be approved, he can access the site and view his submitted applications and details. Although the requestors cannot see the To-Do checklist details, they are able to clearly see the calculated percentage of completion for that submission. This keeps everyone informed of the progress as it changes. The View Detail of an application submission allows Administrators to review a checklist To-Do items. This application uses one Microsoft SQL Server database. There are about 20 tables in the CommFact application and 100 web pages. Currently there are ten to 15 users, processing about six transactions per month. Production is in its early stages with the application only having been released in a very limited market. It took two person-weeks for our small team of two developers to complete this project using Iron Speed Designer. Event Usage Logging to a database table. When an application is submitted, a master copy of the To-Do list is applied to this Application with the status of each item defaulted to Undone. To-Dos appear in a pre-specified order. During the review and approval process, an Administrator can check To-Dos off the list as they perform each back-office task. There are about 60 default tasks that need doing to approve each application. A percentage status is displayed to the end user so he can see the progress of his submission (e.g. 74% complete). Password Encryption using TripleDES. Passwords are encrypted in the database. The customer requested a "Lost Password" feature which includes decrypting the password before emailing the credentials. Email/fax/text message notification system with easily changeable text file verbiage using replaceable tokens. Automatic email to end users. Automated Text Message to Administration's cell phone, or email depending on that particular person's preference. Text file verbiage is easy to manage and update since it is a simple text file. Although changes are not anticipated regularly, there is no need to hire a developer to change it. Replaceable tokens within the text file notification text allow for easy basic customization of the message. For Example, "Dear [UserFirstName] [UserLastName],". The real values are replaced by the system before the message is sent. Active/Locked user verification on attempted logon. New user workflow where a user is unable to access the system after registration, until an Administrator "Approves" the user by clicking an Approve button. This Approval process uses the notification sub-system to send an email to the user informing him that he was approved and how to access his account. 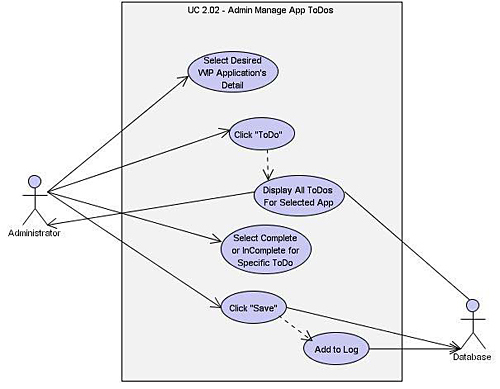 New application workflow where a user submits a new application online and the application is pending while an Admin is notified via Pager or Cell Phone Text Message. When the application is approved or rejected, a notification email is sent to the user informing his of the final decision. 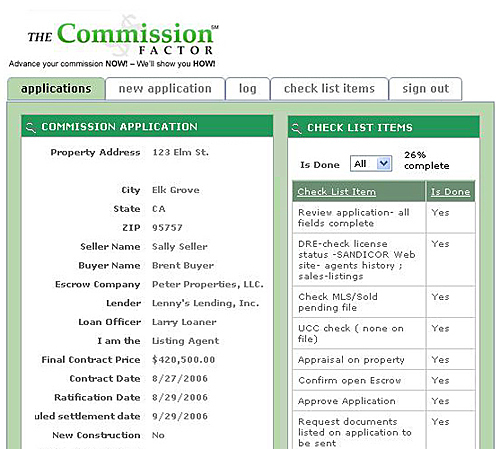 Agents and brokers can view only their own applications and are unable to modify anything. The figure above describes what happens when a user logs in. We spent about one man-week on this portion of the project. 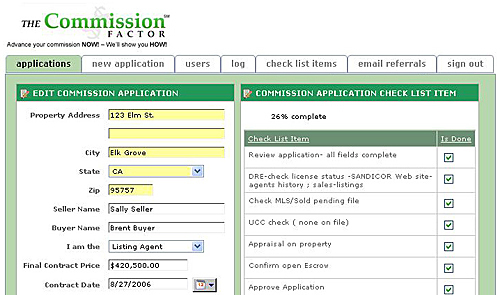 The application has several page customizations, including updated Show Table pages that display an in-line Delete icon (a red "X"), altered submission and review submission pages that pull together record panels of related data, and a number of small changes such as showing the submissions' percentage completion. This page was customized so the Approve or Reject icons are inline for each submission listed. We decided not to use a database View for this application because TheCommissionFactor wanted to see the data in logical regions on the screen. The CommFact design them was created exclusively for TheCommissionFactor company. We changed the CSS of an existing Iron Speed Designer design theme to synchronize the colors with the customer's desired corporate look. We saved approximately $50,000 in development costs and two and a half man-months of development time using Iron Speed Designer. By hand, the project might have taken as long as three months. Without the time I saved using Iron Speed Designer, this project would not have been feasible. The application would have been too complicated and too expensive to build by hand. I might have been able to complete some version of the application, minus all of the automation. However, this would have required TheCommissionFactor to pay a lot more money in the long run for the employees needed to do all of the back-office work manually. We do not have future plans to extend the application for this particular customer. This phase covered all of their current business needs. While the initial release was targeted at users in the southern California area, in an effort to maintain control of the growth, the next phase is targeted to expand throughout California and later throughout the United States. Jim Murphy is Owner and Chief Application Designer and Developer for River City Software Development LLC. Jim has been programming professionally for over 16 years in fields that include Health Care, Insurance, Banking/Lending, Real Estate, Oil & Gas, Manufacturing, and Government.